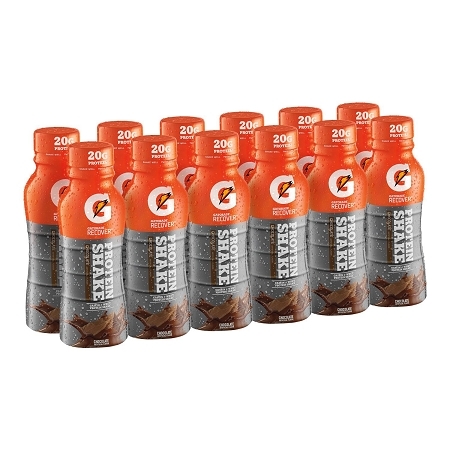 Gatorade G Series Recover 03 Protein Recovery Shake is a post-workout beverage that rebuilds muscle with essential amino acids”. Drink 30 minutes or sooner after a workout. One whole 11.16 fl oz (330 mL) carton is one serving and contains 270 calories, 1.5g fat (1g saturated), 0 cholesterol, 320mg (13%) sodium, 19% potassium, 45g carbs, 1g fiber, 20g sugars, and 20g of protein. It also contains 35% daily calcium and 2% iron. Ingredients include water, maltodextrin, milk protein concentrate, sucrose, whey protein concentrate, dextrose, and cocoa. Excellent product to take post workout or athletic game. Good taste and a nice amount of protein. Many of my players take this product on a daily basis. I must say, I totally impressed with supplements and the shipping time frame considering I live in the Virgin Islands. The free shipping is a big plus. The virgin islands definitely have an endurance community that participate in cycling, running, swiming, and triathlon events.